"When eggplants are in season we make these yummy eggplant balls a lot. 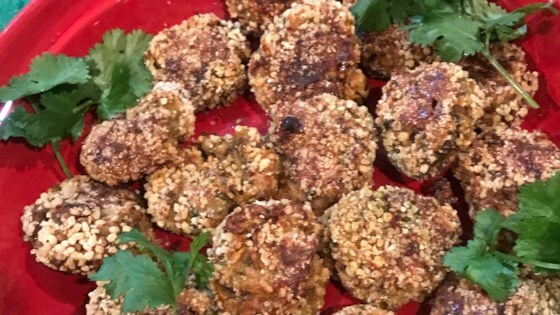 They are made with baked eggplant, Parmesan cheese, breadcrumbs, and I add mint for extra taste! Feel free to experiment with other cheeses." Wrap each eggplant in foil and place on a baking tray. Bake until skin can easily be pierced with a fork, about 45 minutes. Slice each eggplant in half, discard seeds, and scoop out soft flesh; place flesh in a colander. Place colander on a plate; cover eggplant with foil and set a heavy object, like a plate with some cans, on top of the plate to squeeze out any excess liquid. Let stand for about 20 minutes, then chop the flesh, squeezing out extra water as you work. Increase oven temperature to 400 degrees F (200 degrees C). Grease baking sheet with olive oil. Combine chopped eggplant, egg, grated Parmesan cheese, breadcrumbs, mint, salt, and pepper in a bowl; mix well. Scoop up a small amount of eggplant mixture and roll into a ball between your palms. Roll in breadcrumbs and place on the prepared baking sheet. Continue making balls and rolling them in breadcrumbs until mixture has been used up. Bake in the preheated oven for 40 minutes until golden brown, carefully turning balls after 20 minutes. Eggplant are full of water so this mix will still be quite moist even after squeezing out excess liquid. Add more breadcrumbs if you prefer a firmer texture. Also, be careful when turning the balls in the oven because they easily fall apart.